Once we have all of the wood for our project, we can cut the boards down to size based on the cut-list listed above. We’ll start by attaching our four 2×6 boards. 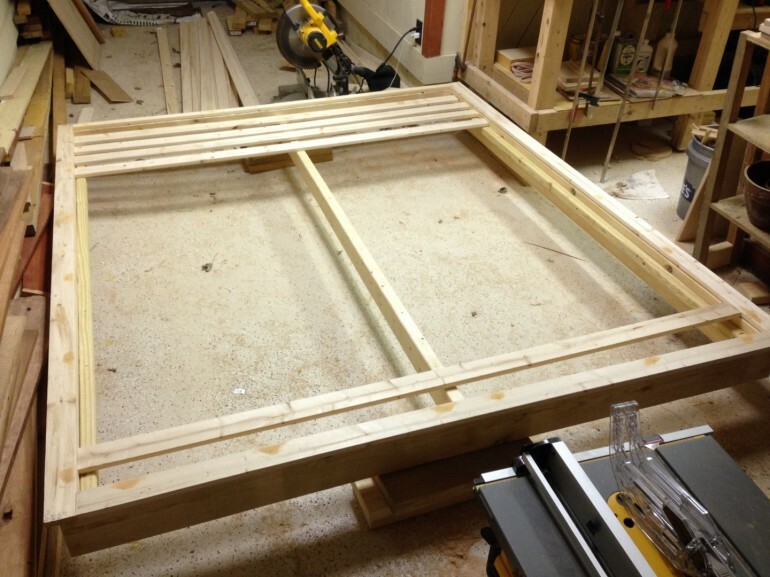 The two longer 84″ boards are the sides and the 75″ boards are the top and bottom of the frame. 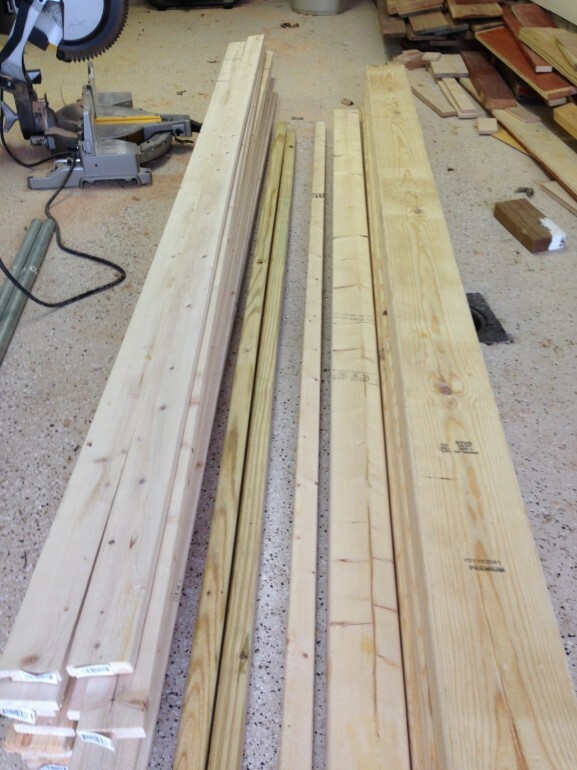 Lay these boards out so that the 75″ boards are on the outside as shown below. This will ensure a snug fit for the mattress. 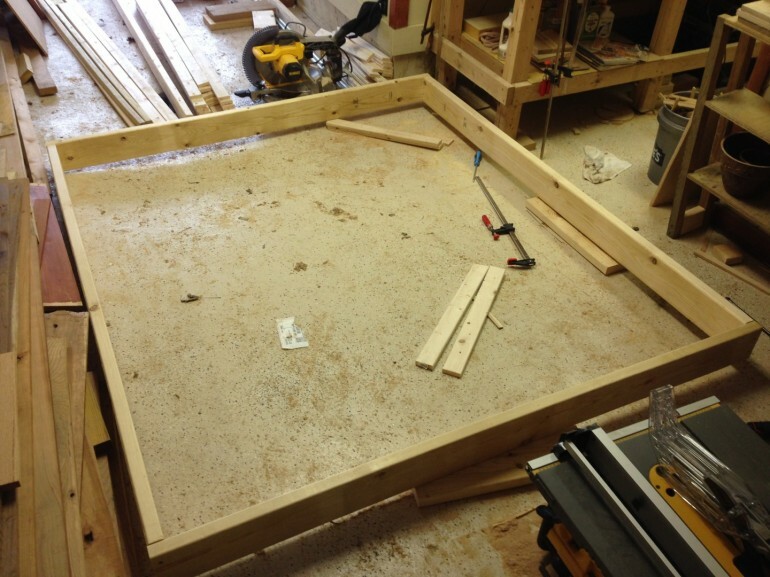 The frame laid out with the 84″ boards on the side, capped by the 75″ boards on the top and bottom. 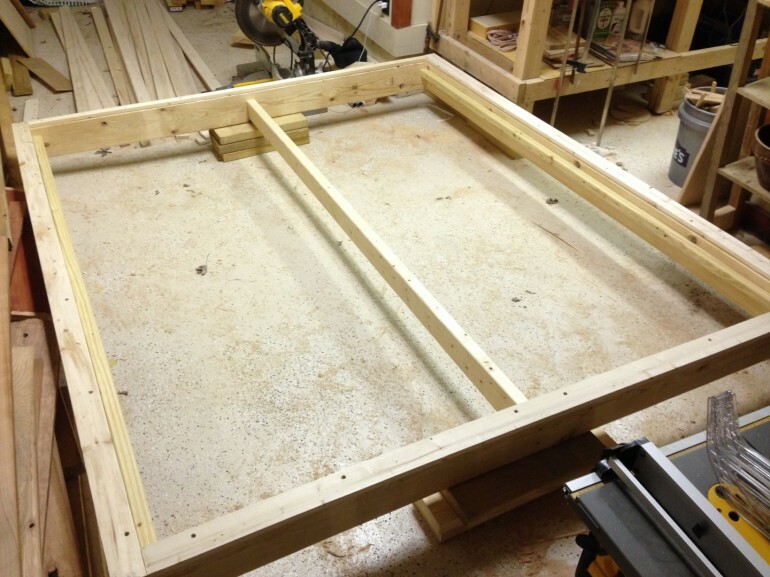 With the frame laid out, attach all four corners by countersinking and screwing in the top and bottom 2×6 boards. I used a clamp and some spare boards to hold everything flush while I attached them with screws. Use a clamp and spare boards to hold everything flush while you attach your frame. Once your four 2×6 boards are attached, we are going to attach our 2x2s to the inside of the frame as cleats to hold the slats. 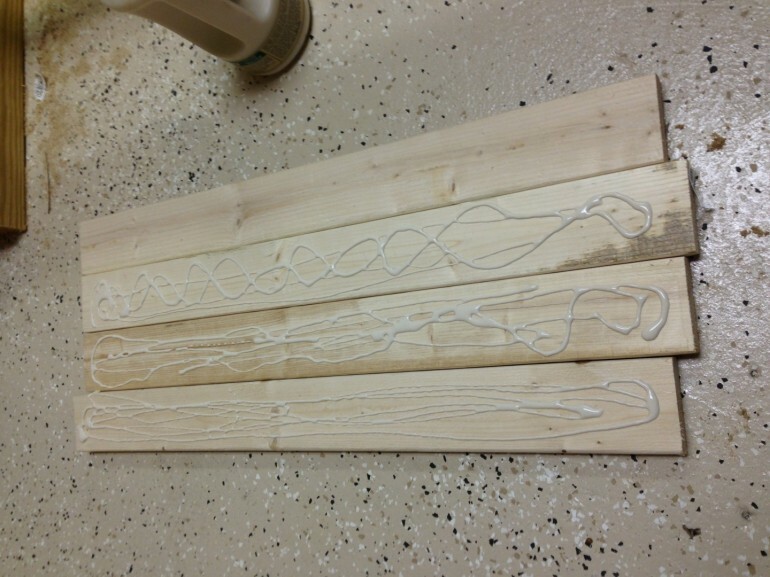 You will want to attach them 1 1/4″ from the top. I put together a quick jig that helped me keep a consistent distance from the top of the frame; however, this isn’t needed. 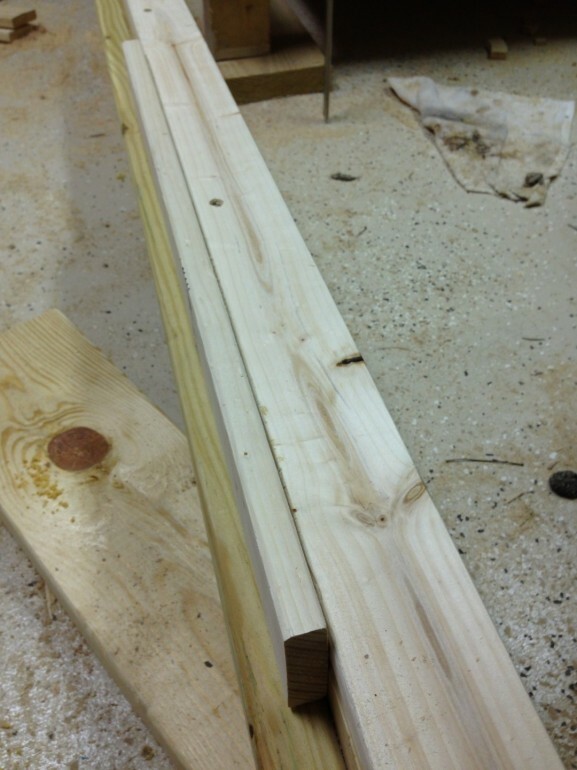 Be sure to use your countersink bits to keep from splitting the wood. 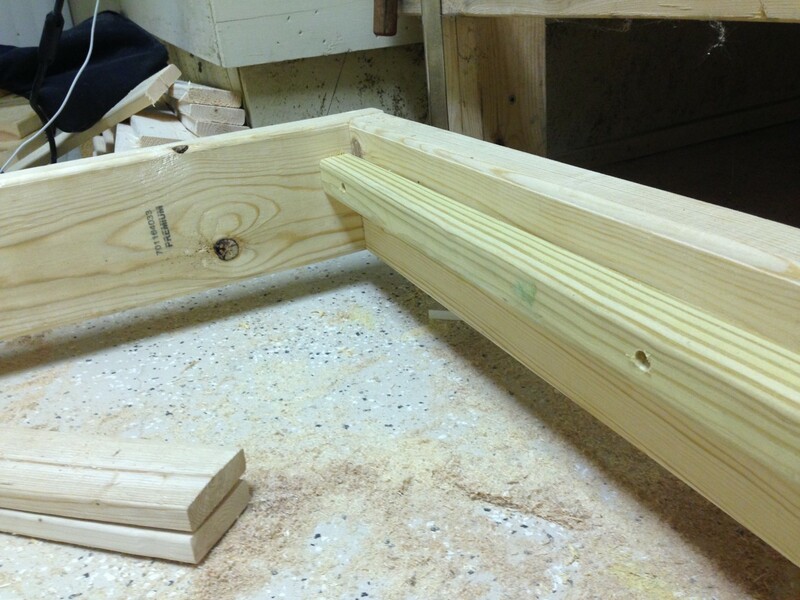 Once both 2×2 cleats are added to the inside of our frame, we’re ready to move on to attach the middle support beam. For the middle support beam, we want to use our 84″ 2×4 board. Add a mark to the very center of your bed frame, then line up the 2×4 accordingly. 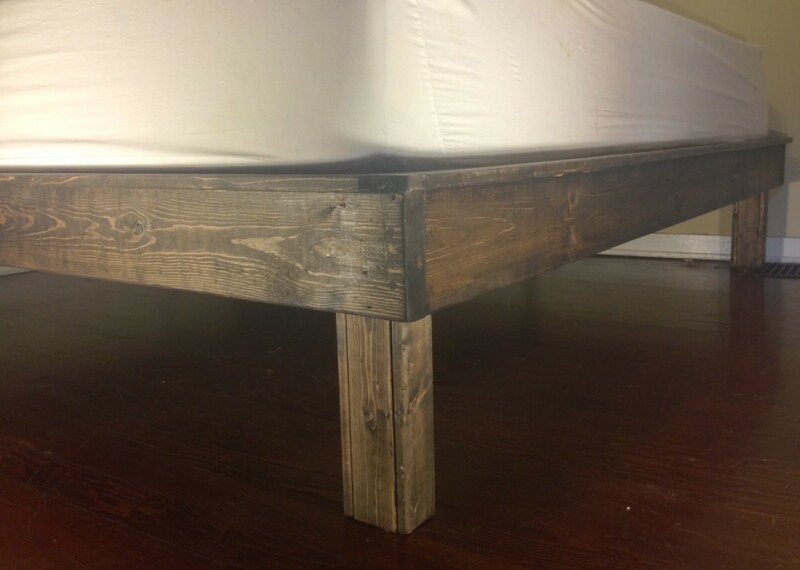 Flush the board with the bottom of the bed frame. This should leave 1 1/4 inches from the top, which is the same distance as our cleats. Countersink and screw in the board from the outside of the frame to secure it in place. Now we’re going to add decorative overhanging trim onto our frame. For this we will use some of our 1×3 pieces. 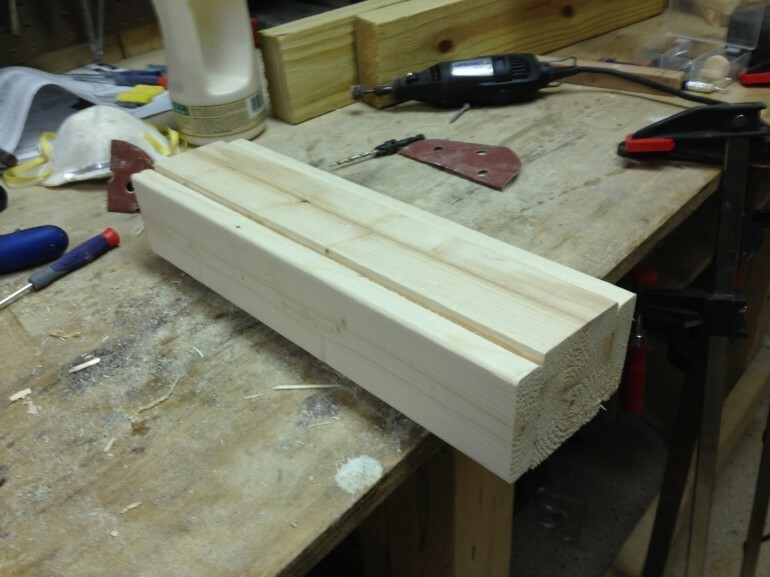 The 88″ pieces go along the sides and a 72″ piece goes along the bottom. We’re going to add a non-overhanging piece at the head of the frame later since it will be flush up against the wall. To add our trim, flush the the 88″ pieces with the inside of the frame. An easy way to do this is to set a spare board onto the cleats as shown below, and push the trim up against it. 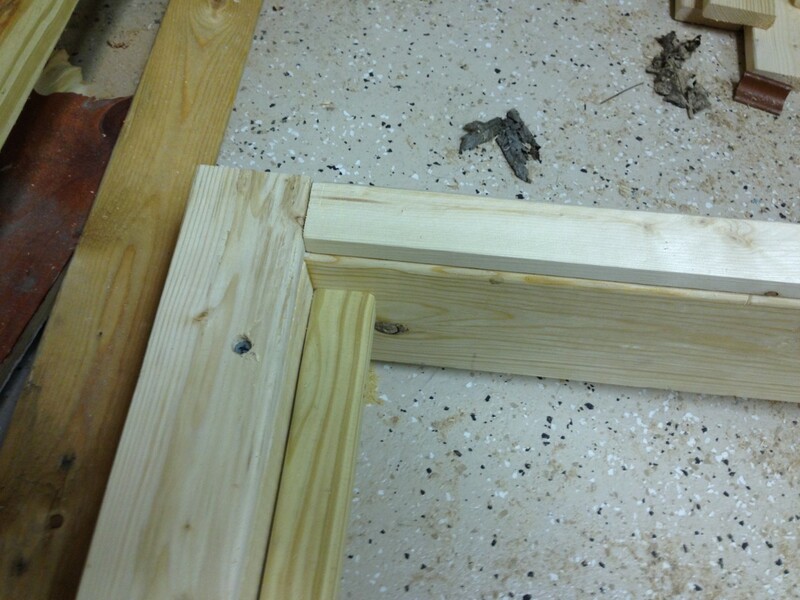 This will cause the trim to overhang the frame by 1 inch. Then you will want to flush the end of trim with the head of the bed frame. Once flush, the bottom should have a 1 inch overhang as shown below. With the trim flush to the inside and head of the frame, countersink and screw the trim into place. Do this for both sides. A 72″ 1×3 piece of trim should now fit right in at the bottom of the frame. Attach this using the same method. 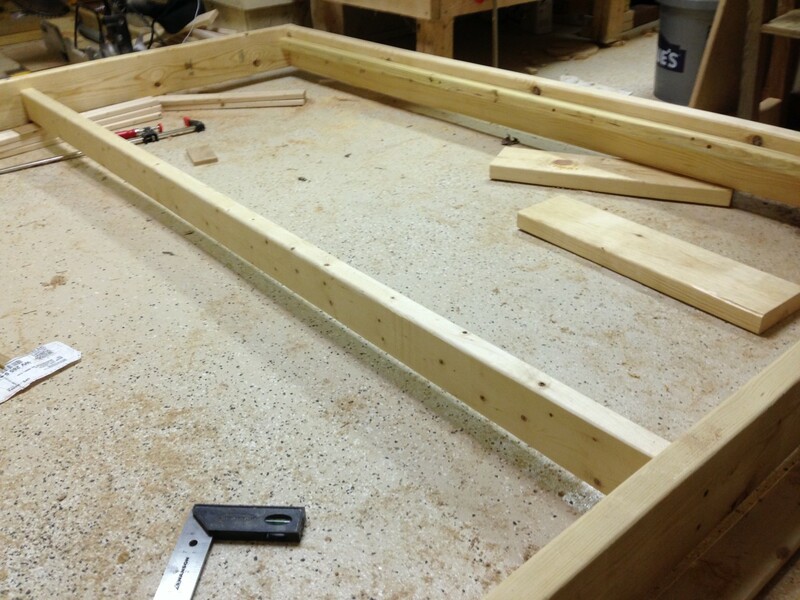 With the side and bottom trim in place, we now want to add the 1×2 board to the head of the frame. This will allow the bed to set flush up against the wall. Be sure to use your countersink bits when attaching this piece or else it is likely to split the wood. Great! Our bed frame is coming together nicely. We are now finished with the main frame. All that is left is to cut the slats and attach the legs. Make sure your slats fit into your frame. 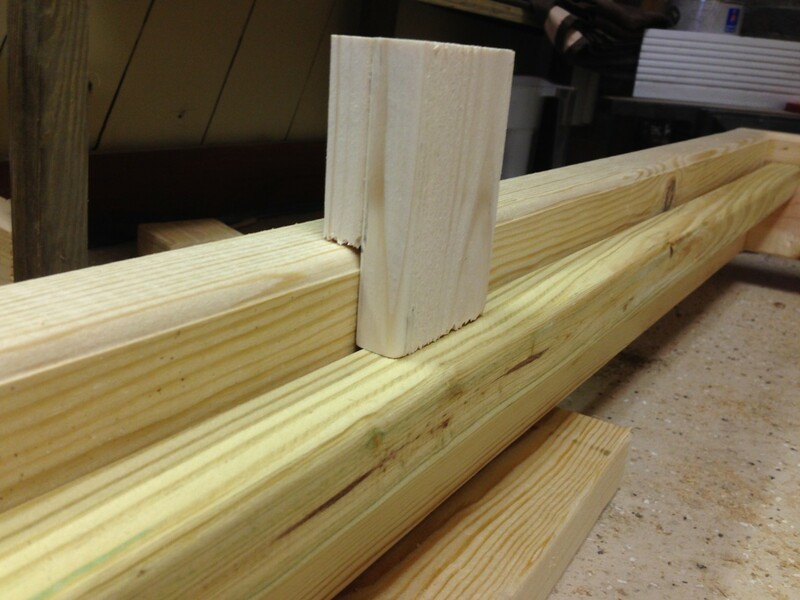 Once you test the slats and they are all cut to correct size, you can set them to the side while you attach the legs. I originally planned to use either 2x4s or 4x4s for the legs; however, I wanted to try something a little different with a few of the scrap 1×3 pieces I had left over from cutting the slats. This step is completely optional. If you would rather save some time and effort, you can choose to use 2x4s or 4x4s for the legs as I had originally intended. With that said, this is how I assembled mine. I glued together 4 separate 1×3 pieces back to back and let them dry. Once the 4 pieces had dried back-to-back, I then glued a 1×3 piece to each side, leaving a slight bulge protruding in the front and back for added texture. Once the final piece dried, I cut it down to 13.5 inches as shown below. I repeated this process for all four legs and then attached them. Unfortunately I did not get images of the legs being attached. 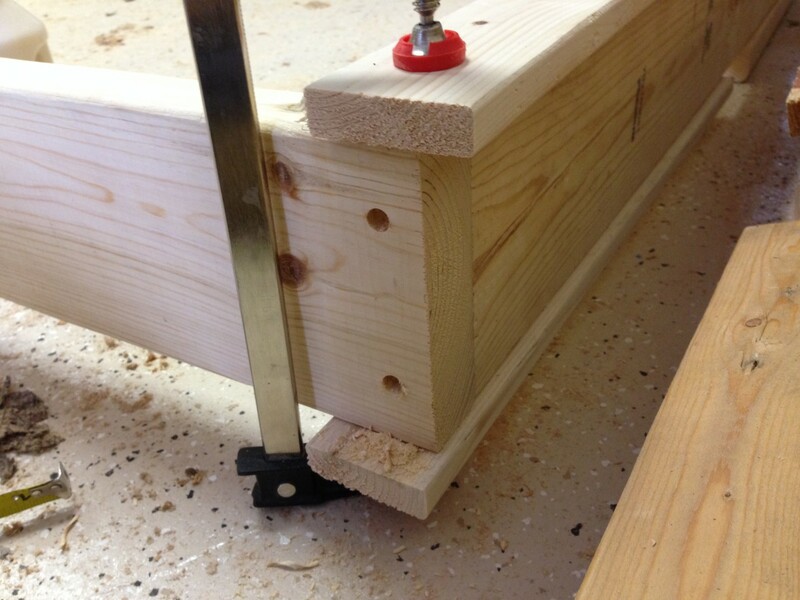 To complete the process, put a leg in each corner of the bed frame directly under the cleats. The cleat should resting on top of the leg. Attach the legs using countersink bits and screws. Depending on the size of legs you chose to use, you may need to use different sized screws. Measure the thickness of your legs and use the size of screw appropriate. 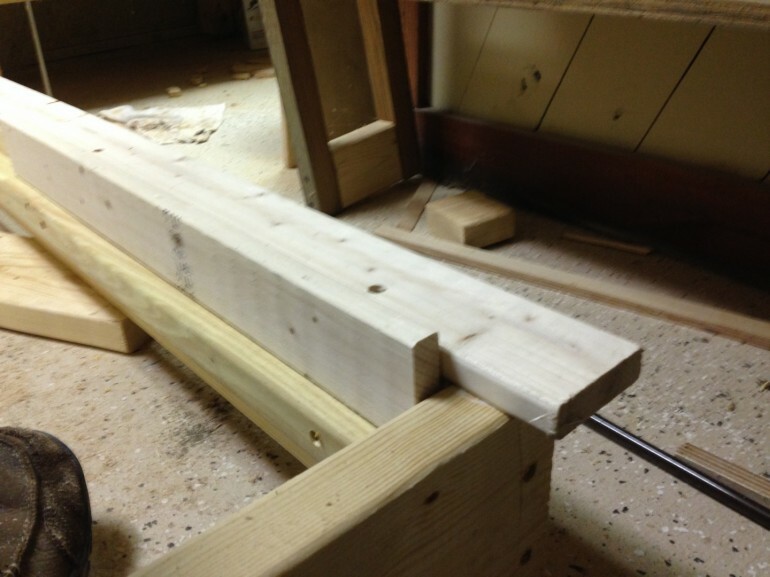 For example, I used 3 1/2″ screws, but if you chose to use 2x4s then you would use 2 1/2″ screws. Also, for added support, I attached a 2×4 leg in the very center of the middle support beam. Once the mattress is on, this support leg is out of sight, but makes the bed much more sturdy. After the feet are attached. All that’s left is to stain the wood using a stain of your choice. I used Minwax Dark Walnut. I won’t go over the details of staining, but just follow the directions on the stain of your choice and you’ll discover it’s a simple process. That’s it! You’re all finished up. 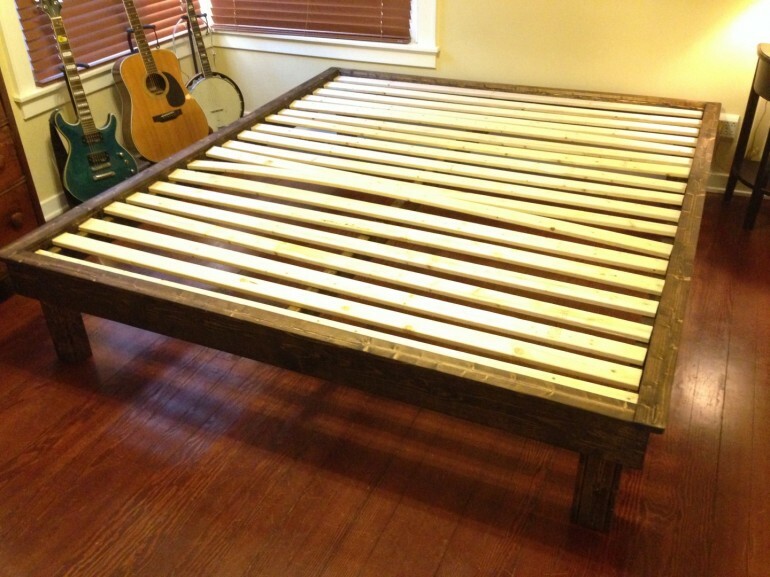 This bed frame not only looks great, but will save you a ton of money. Mattresses and bed frames can cost thousands of dollars. I recently purchased a 12″ California King Memory Foam Mattress from Amazon for around $550. Paired with this bed frame, my total cost for a brand new California King mattress and bed frame came to about $650. You can’t beat that!